A Which? survey has revealed that it’s definitely worth taking a plant back to the garden centre if you’re not happy with how it has grown – provided you’ve looked after it correctly. Only a fifth of those who had experienced problems had tried to return a plant, but those that did were pleased with the outcome. Six in ten received a replacement and about a fifth received a refund. Only one in ten were refused any kind of compensation. 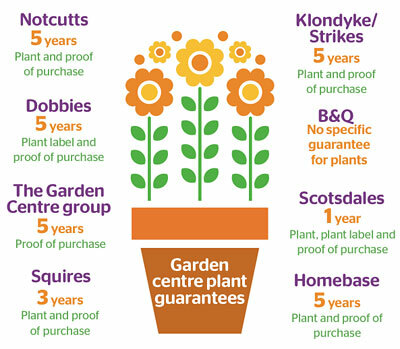 Many garden centres now offer guarantees on hardy plants, some as long as five years. Under the Sale of Goods Act you can take a plant back without a guarantee, but the advantage of a guarantee is that it gives you more time – if you’ve waited for it to flower or fruit, for example. ‘Proof of purchase’ is anything that shows where a specific item was bought. A receipt is the best example, but it may include an email confirmation and possibly a credit-card statement (although this will only show the trader’s name, the date of purchase and the amount paid, not the product details).